This cake is no-bake and uses three ingredients. And it’s very chocolaty and easy. Okay, good. I thought so. 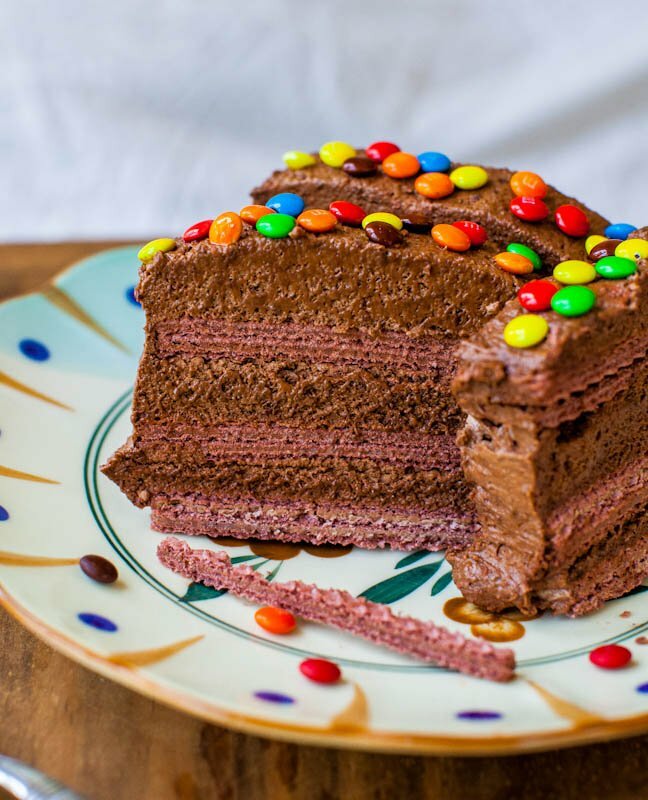 You could also make this cake using vanilla wafers and vanilla pudding or coconut cream pudding or banana pudding or whatever pudding you love. Or if you’re like me, nothing other than chocolate will do. 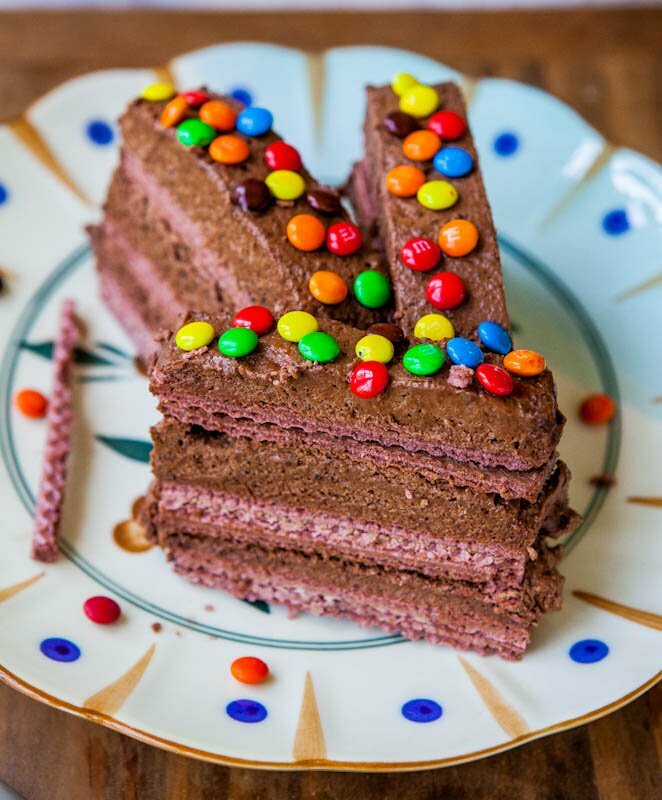 I was bound and determined to make a chocolate wafer cake using chocolate pudding and went to five grocery stores on the island for a three-ingredient recipe. I wish I was but you know how it is when nothing besides chocolate will do. Had I wanted pistachio pudding or caramel flan pudding, there was a surplus. This cake was worth schlepping into five different stores and if you don’t have to go to five stores for three ingredients, you can make it in your sleep in about five minutes. With ingredients you can probably pick up at any 7-11 in America. Let’s make a no-bake cake. 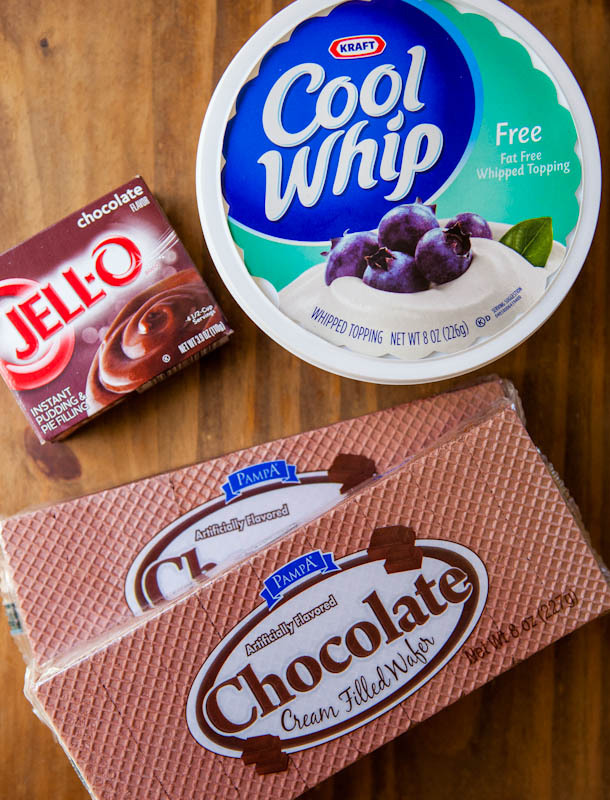 Recipe Notes: The stores here only had Fat Free Cool Whip in stock but use any kind you wish. Not a fan of Cool Whip? Make your own whipped cream by whipping heavy cream and adding sugar. Not a fan of pudding mix? Make your own homemade pudding on the stovetop and mix it into your homemade whipped cream. There’s a way to make an ‘easy dessert’ more complicated by making each component from scratch. I chose the easiest path but choose the paths you prefer. Two boxes of instant chocolate pudding (not cook-and-serve style) and two containers of Cool Whip or whipped topping are necessary. I realize there’s only one box of each in the photos so I’m just pointing that out. Two containers of Cool Whip sounds like a lot but when it’s mixed with the pudding, it deflates, is much less fluffy, and starts to solidify from the pudding and doesn’t go as far as you think it will. Line the pan with 9 wafers down the center. The more centered they are down the middle of the pan, the easier it will be to cover the sides of the cake in the final step. Mix one tub of Cool Whip + one box pudding and spread the mixture on top of the wafers. Make sure to work quickly after combining the Cool Whip and pudding because the mixture will thicken as time elapses and becomes harder to spread and you don’t want to crush those pretty little wafers trying to spread chocolate cement. Add another layer of 9 wafers and cover with the remaining pudding mixture. Use the other half of the mixture to cover the sides of the cake, by carefully smooshing it down the sides with a spatula or knife and it’s okay if it’s not perfectly applied. You just don’t want a bald cake on the sides. How horrifying. Place the wafer baby in the freezer to set up for at least six hours, overnight, or even a couple days in advance. Prior to serving, garnish with M&M’s (the fourth ingredient if you’re keeping track) or chocolate shavings, diced Butterfinger candies or diced peanut butter cups, coconut flakes, nuts, or whatever sound good and even if you don’t garnish it, it’s mighty tasty. 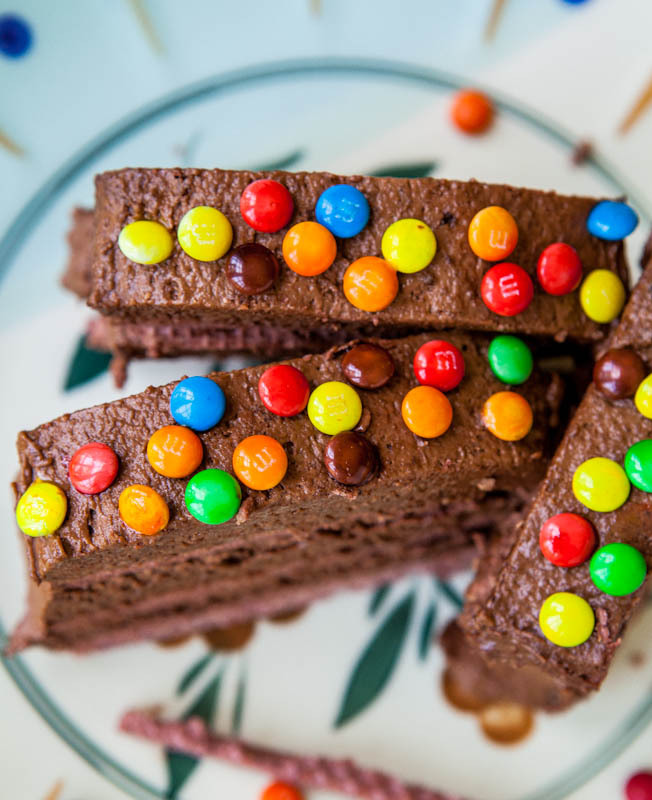 If you’re using M&M’s they will run and bleed as the chocolate pudding mixture softens at room temperature so don’t plop them on until right before serving your little masterpiece. So chocolaty and satisfying in that way that only chocolate can do, yet it’s light because Cool Whip and wafer cookies are inherently lightweights. The chocolate mixture slightly softens the wafers over time but they definitely still retain plenty of crunch. They don’t turn limp like graham crackers do in an Icebox Cake or like Ladyfinger Cookies do in tiramisu. I am just not a fan of mushy desserts and the wafer cake isn’t mushy in the least. Prepare a 9-by-5-inch loaf pan by lining it with aluminum foil and leave overhang over the sides. I sprayed my pan with Pam for Baking, just to be safe. Line the pan with 9 wafers down the center (the more centered they are down the middle of the pan, the easier it will be to cover the sides of the cake in the final step). 9 wafers fit perfectly and snugly in my pan; set aside. In a large mixing bowl combine one container of Cool Whip and one package of pudding and stir until smooth and combined, working quickly as the pudding will start setting up as time elapses. Spread about half the mixture over the wafers in a smooth, even flat layer. Add another flat 9-wafer layer of wafers and spread the remaining chocolate-whipped topping mixture over them. Add another flat 9-wafer layer of wafers; set pan aside. In the same large mixing bowl combine the second container of Cool Whip and the second package of pudding and stir until smooth and combined. Spread half the mixture over the third row of wafers. 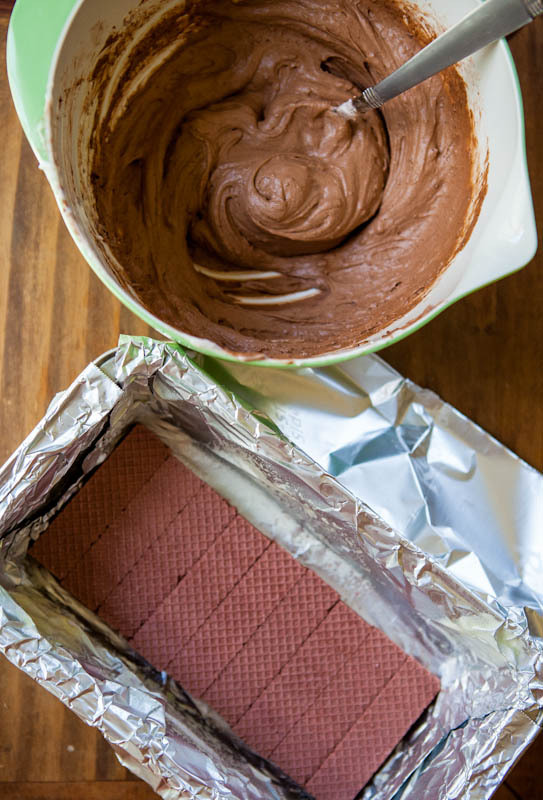 With the remaining chocolate-whipped topping mixture, carefully apply it to the sides of the wafer cake using a spatula or knife to push it down the sides of the cake, covering the sides as best you can so that they will not be lacking in chocolate-whipped topping coverage or ‘bald’. 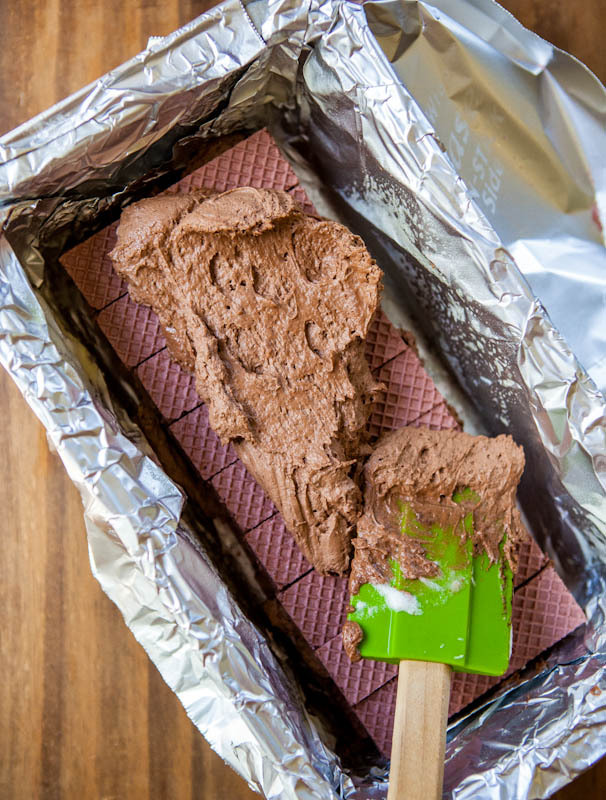 Cover pan with foil or plasticwrap and place in the freezer to set up for at least 6 hours, overnight or 24 hours in advance is better, since the wafers will soften slightly from the chocolate mixture as time passes. 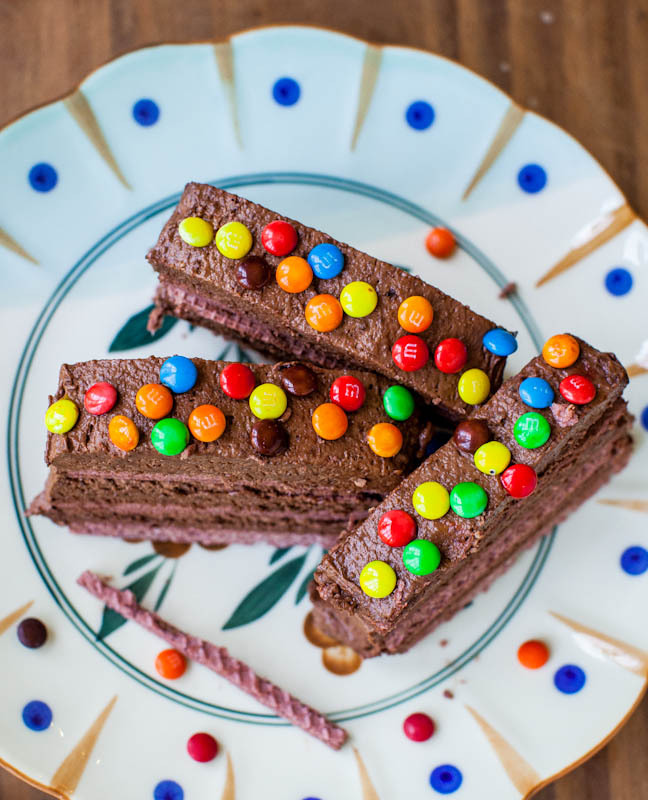 Before serving, optionally garnish with M&M’s (or chocolate shavings, sprinkles; or try coconut flakes, slivered almonds, toffee bits, crushed Butterfingers, diced peanut butter cups – don’t garnish until serving if using M&M’s because the color will begin to bleed and run). 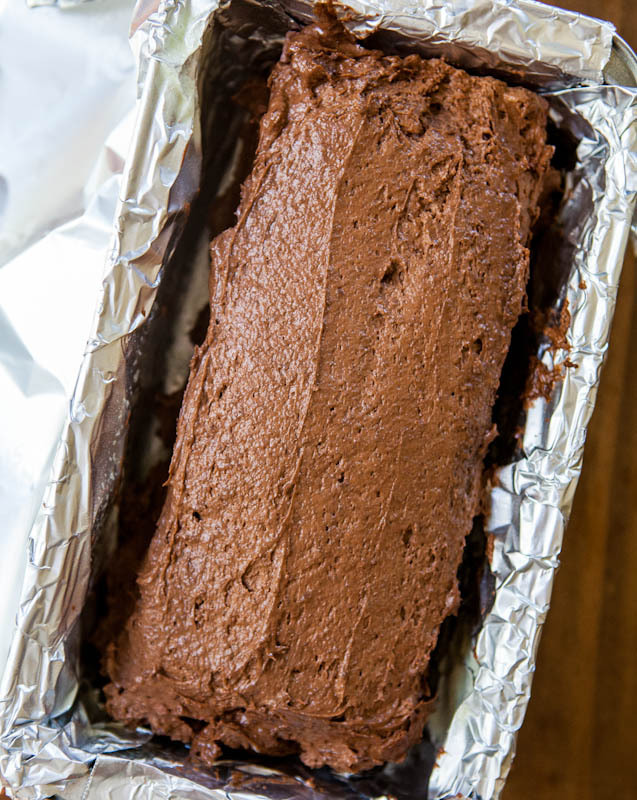 Lift cake out of loaf pan by holding the overhang and place on a cutting board, slice and serve. I try to slice where I know there’s a slight space or gap between the wafers rather than slicing through them. Cake will keep for up to one week in the freezer. Notes: Make sure you use Instant Pudding, not Cook-and-Serve; two containers/packages each of Cool Whip and pudding are necessary. I made the recipe using Fat Free Cool Whip and it works just fine as would Lite or full-fat/regular. I’m sure Sugar-Free Pudding ‘works’ theoretically but I’m not sure how it tastes because I used regular instant chocolate pudding, as shown. I’m sure you could make this cake making your own whipped cream by whipping heavy cream, and incorporating cocoa powder, sugar or confectioner’s sugar into it, or making your own chocolate pudding from scratch and incorporating that into homemade whipped cream, and applying that mixture to the wafers; however I do not know the ratios and it’s more work than I am interested in doing for a fun and little dessert. To keep Gluten-Free, use Glutino Gluten-Free Chocolate Wafers and take note that the pudding and whipped topping used are gluten-free and suitable for your dietary needs. 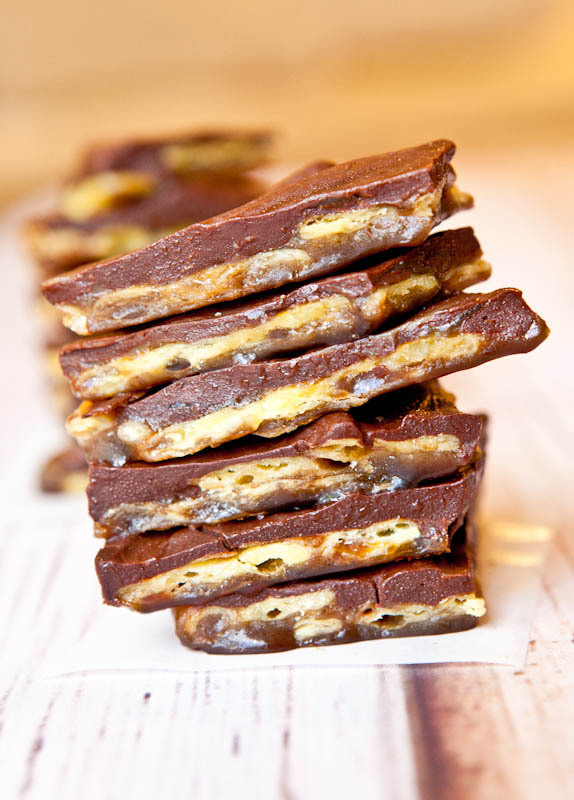 Chocolate Saltine Toffee, i.e. Christmas Crack (4 key ingredients) – I made this the last time I was in Aruba, over Christmas 2011, and after making this and having it melt or nearly melt in the photos, I was ultra-prepared before I started photographing the wafer cake so that it didn’t melt on me. As an aside, I hated these photos but Martha Stewart liked them. 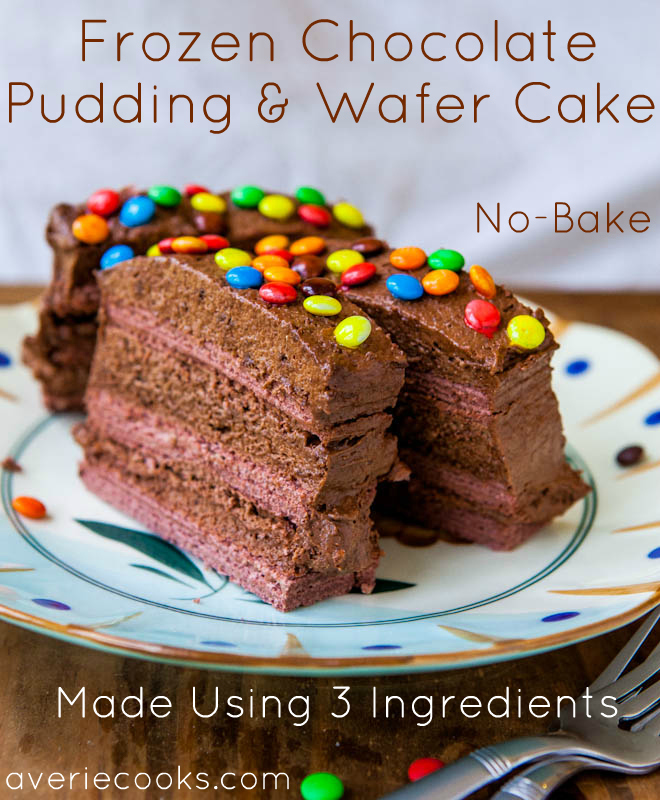 Have you ever made a wafer cake or a graham cracker cake? Sometimes desserts made using graham crackers, like icebox cakes or tiramisu with Lady Finger Cookies, can get a little mushy for my taste, which is why I used wafers since they have more structure and crispness. Not to mention, I had a thing for them growing up. I’d try to separate them like separating an Oreo cookie. Crumbly, mess-making, kiddie fun at its finest. Any good recipes for Cool Whip or a box of pudding? Angel Lush is a favorite Cool Whip recipe of mine, a favorite of my mother’s, and of every other woman bringing a dessert to a church-basement potluck where I grew up in Minnesota. We may as well milk the no-bake desserts until summer is over, right. I love it when I can trick people into thinking I slaved over something when it’s really EASY – and this is one I think I totally could! seriously lady you have some GOOOOOD recipes. I check up on it everyday for new recipes and am never disappointed!!! 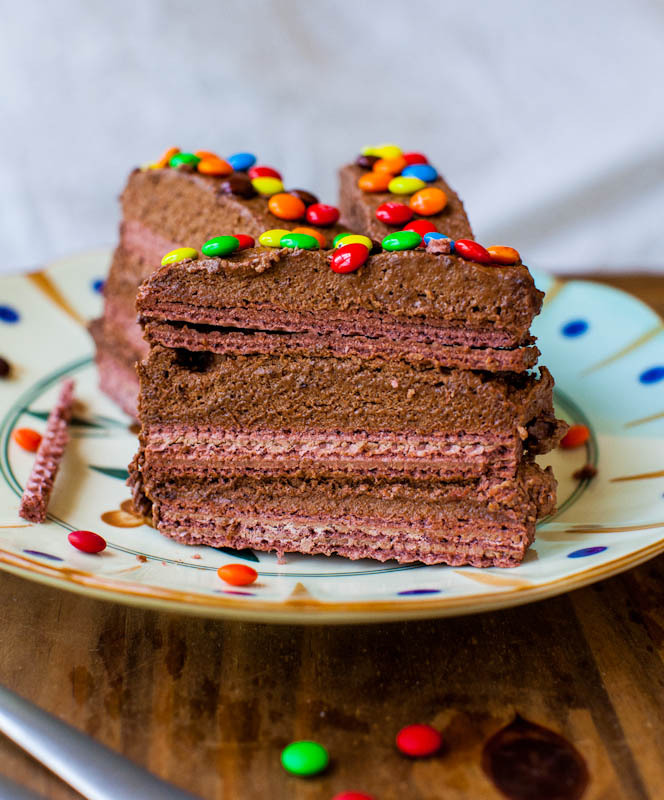 Your Chocolate Wafer Cake looks awesome! I hate to be so dense, but do you mix up the pudding or just mix the pudding powder with the Cool Whip? You just mix together the dry pudding mix and the Cool Whip. You don’t actually make the pudding with cold milk, etc. And once you add the Cool Whip to the pudding powder, be read to GO! It starts setting up pretty quickly..within minutes. So have everything read to spread and you’ll be set. LMK if you make it! Oh YUM. Just last night I discovered I had cool whip and cream cheese and was craving peanut butter… mix with some cheesecake pudding mix.. Hello pie! Pie is probably my favorite pudding/cool whip treat. All of the no bake treats I’ve been seeing everywhere are amazing and remind me I have these things that I can use to easily make something yummy. I….I think I love you! =P This looks so awesome!! I love those wafer cookies and take them apart like you did (do?). We have mocha wafer cookies where I’m at and I think I’ll try it with them. If I can control myself!! I’m thinking of all sorts of wafer cookie/pudding combinations now! Thanks Jenie and glad you like it and my blog! Sorry this is an older recipe that never has been reformatted to my newer printing format. I recommend just copy/pasting the recipe portion into an email to yourself and printing that way. Should only take a second or two. Enjoy the dessert! This is such a cool recipe. I would really like to try it. In India we don’t get instant pudding mix or cool whip. Can I prepare my own chocolate pudding (using cook and serve pudding mix) and use here. I can make my own cool whip by whipping cream. I can then mix the chocolate pudding with the whipped cream and use it for layering. Will this work? If yes, how many cups of pudding and whipped cream do I need? Thanks in advance for your response! You could possibly get this to work but the issue is that real whipped cream deflates over time and gets runny so I worry that this could turn messy and sloppy. You could try it using 16 oz very stiffly whipped cream and probably 4-5 cups of pudding.